In the event that your child will be late or away from school, please call or leave a message with Mrs. Bosch at 306-791-8483. Please leave your child's name, grade, teacher and the reason for the absence. We appreciate your help! Lockdown (threat in or to building) - All school occupants are secured in designated locked areas and regular activities are stopped. Secure the Building (threat outside the building) - All exterior doors are locked. No one can enter or exit the building. School activities continue inside the building. Evacuation - Students will exit the building to a designated location. All students will be accounted for once safety exited. Ruth Pawson is striving to be a cash-free school. For safety and efficiency reasons, we want to reduce the amount of cash and cheques coming into our school. All school fees can be paid on-line. If you need assistance, please call Mrs. Bosch in the school office at 306-791-8483 or stop by the school. 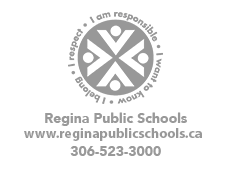 You can also find instructions on the Regina Public Schools' website under the "Parents" link click here. Thanks for your cooperation! Please find attached Regina Public Schools' "Driver's Authorization Form" (click here). This form needs to be completed each school year. In order to drive students, you must have a Police Information Check (PIC) on file with us as well. Please contact our school office to get a letter of introduction to take to the Regina Police Service. The Police Service does not charge a fee for PICs for volunteers.